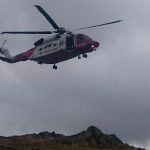 A 23 year old lady, walking with a family group, slipped and fell 7 metres off a crag whilst attempting to descend into the valley. 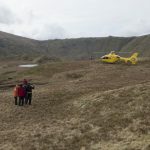 She suffered a broken arm, and a head injury which was sufficiently severe to suggest to the first Team members on scene, that she should be airlifted to hospital as soon as possible. There was low hill mist, but the actual cloudbase was high enough to enable Rescue 999 from Prestwick to attend and winch the casualty direct from the accident site. She was flown to the Cumberland Infirmary in Carlisle for treatment. 14 Team members – 2 hour 12 minutes.